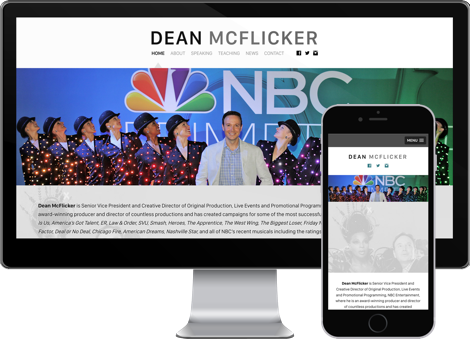 Dean McFlicker is Senior Vice President and Creative Director of Original Production, Live Events and Promotional Programming, NBC Entertainment, where he is an award­?winning producer and director of countless productions and has created campaigns for some of the most successful shows on television. When I was hired to design and develop Dean’s new website, he made it clear to me that showing up in search engines was not the priority but rather it needs to host his portfolio and other work he may want to showcase. We were able to pack a lot information into not a lot of space due to our use of an ajax “load more” button that allowed Dean to host as many videos as he may want.